Other artefacts associated with the island are the flint core/scraper, small chert arrowhead, large flint arrowhead and polished stone axe. Photographs: Joe O'Shaughnessy. A rare artefact that was tangled in seaweed attached to lobster pots may indicate the presence of a submerged prehistoric landscape off the north Connemara coast. The flint core or scraper is “almost certainly” from a submerged site near Lettergesh, according to archaeologist Michael Gibbons. “It is difficult to date precisely, but is likely to be 4,000 to 6,000 years old,” Mr Gibbons says. The flint core, located in the lobster pot string by David Coyne, could have been used as a large scraper to clean hides or skin. 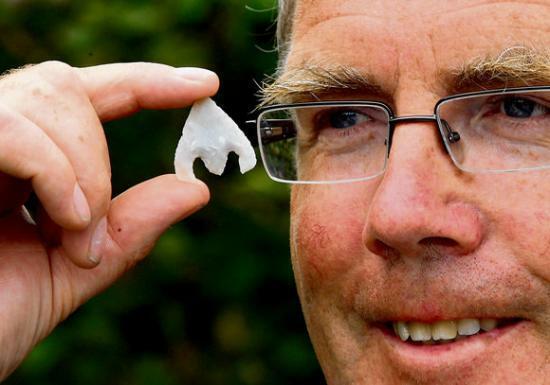 “The sea level rise on the Galway coast may have been by as much as 10 metres since the first people settled here almost 10,000 years ago, and this discovery suggests that this rare find is just the tip of the iceberg,” Mr Gibbons says. Several submerged landscapes have been located by archaeologists along the west coast. The remains of a midden site farther along the coast at Tullybeg were dated to between 6,000 and 7,000 years back by a team from Queen’s University Belfast, he points out. A flint arrowhead also recently located on Inishbofin off the Galway coast is the fifth such artefact to be associated with one area – the island’s west quarter. The arrowhead is early Bronze Age, which Mr Gibbons describes as “one of the finest ever to be found on Ireland’s west coast, and is a classic museum piece”. The new addition also makes it the largest collection of arrowheads from one single location in Co Galway, Mr Gibbons notes. A separate recent discovery – a polished stone axe picked up in Joyce country near Connemara – yields “crucial evidence” of an early farming community living in the high mountain valley system overlooking the Mask and Corrib lakes, Mr Gibbons says. “There are far fewer Neolithic sites in this area compared to north and west Connemara, but there are a number of spectacularly located hill-top tombs crowning the hills,” Mr Gibbons says. Taken together, the artefacts provide “further clues to Connemara’s long and varied settlement history”.